Savvy Mode: Ruffle, An Old New Trend? Ruffle, An Old New Trend? 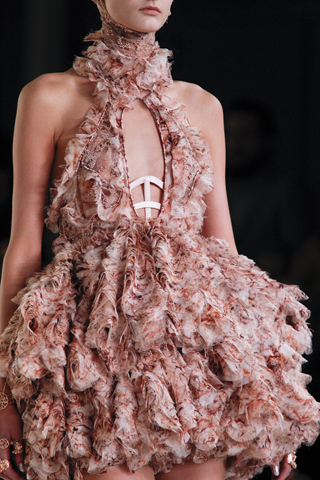 I adore ruffle but looking at this McQueen dress, I am wondering where am I supposed to go with the dress without looking out of place. I suppose I can put a leather jacket or a denim jacket over the dress to take all this ruffle-ness down a notch. This pair of McQueen shoes is adorable. I love to wear them with a very simple outfit. Perhaps fitted tee with a pair of stylish shorts to show off a gal's long legs. I really liked how Chanel is doing ruffle with a simple jacket. Normally I think a ruffle shirt is suitable for my 9 year old niece only but I can see myself wearing a simple top with this ruffled skirt, and finished with a pair of cute booties. How much ruffle can you take on an outfit? I could do a little ruffle and love the last pairing! My take on ruffles is a little goes a long way. But of course, some people do look good in head-to-toe ruffles. If you ask me, I think Chanel got it right. I love ruffles. But that top dress is a bit much. i love that ruffles are making a come back and in a much better way. I love all the ruffles, so feminine! P.S. If you're ever looking to sponsor blogs, I'm currently looking for new sponsors - and I love your blog AND shop. Feel free to email me if you're interested. i love ruffles.. it would be hard to have too much ruffle for me! Could you please let me know how can I send my information to claim the prize. I like ruffles on some people. I don't like ruffles on me. They are wayyyy too girly for my taste, but they really can look beautiful if done the right way. I dig ruffles. I think they have to be worn tastefully, of course. I love the second dress. That is prefection. The shoes are adorable as well. Love the metal embellished neckline. oo, I like ruffles but mainly in small doses, I love the outfit above the with ruffle skirt and streamlined top.